Each night during the eight-day celebration, the Rebbe delivers a discourse that lasts for an hour or two, fol­lowed by rejoicing and dancing in the streets. Right after Sukkot, on Shemini Atzeret, hakafot - processions with To­rah scrolls - are held at "Seven-Seventy." On Sukkot in 5738 (1977), the Rebbe danced as never before. Truly, those who did not witness that night's festivi­ties at the Rebbe's synagogue have never seen what real re­joicing is like! The Rebbe was happy, dancing joyfully with ecstatic abandon. Despite his seventy-five years, the Rebbe was as energetic as a young man. "Seven-Seventy" was filled to overflowing. Thousands of Chassidim were dancing together, their feet moving of their own volition, their eyes shining. The dancing and the singing went on for hours. The Rebbe was focused, in full control of his every step, but his face wore an expression of total bliss - the joy of Torah. Suddenly the Rebbe's face turned pale. He stopped and slowly lowered himself into a chair. The hearts of the Chassidim skipped a beat; this had never happened before. The Rebbe had never stopped during the hakafot. Every­one's eyes were on the Rebbe. Something was amiss. A whisper passed through the crowd, "Is there a doc­tor here?" Several doctors rushed toward the Rebbe. They examined him and found nothing. Still, something was wrong. He was urged to go upstairs to his room and rest a while. The Rebbe absolutely refused to leave at the height of the hakafot. Out of the question. The hakafot continued, but the initial joy was gone. The Chassidim were petrified by the thought that the Rebbe might be unwell. The festive mood had been marred by anxiety. The last hakafah came to an end. The Rebbe rose and walked to his private sukkah adjacent to his office with slow, measured steps. On the way, he instructed the guests, "Do not stop the festivities! Keep dancing!" He entered his sukkah, made kiddush, then settled in his office. Meanwhile, downstairs, the Chassidim went on dancing. Their vigorous singing shook the walls. Yet in the midst of all this revelry, the people's hearts were gripped by fear. The Rebbe's secretaries were already on the phone, calling the best cardiologists in New York. In the middle of the night the doctors, armed with advanced medical equip­ment, hurried to "Seven-Seventy." Four doctors examined the Rebbe thoroughly. The Rebbe took an active part in the doctors' discussion, amazing them with his knowledge of cardiology. They could not understand how someone who had never studied medicine could have such deep insight into the intricacies of cardiac function. The examination revealed that the Rebbe had suffered a serious heart attack. His condition was extremely grave. "Did the Rebbe moan with pain?" inquired one of the doctors. "The Rebbe did not utter a sound," replied the secretary. "That's impossible," said the doctor in disbelief. "He did not cry out, or twist in pain?" "All the Rebbe did was sit down in a chair," replied the secretary. "No one heard him complain or moan." "I have to tell you," explained the doctor, "that the Rebbe has gone through agony. The pain is more than any­one can bear. In all my years of experience, I have never seen a patient react to a heart attack in such a manner. This is incredible," muttered the doctor. "I have never seen any­thing like it." The doctors decided to inject the Rebbe with a pain­killer, but when they asked for the Rebbe's consent, he re­fused. "There is no need," he said. One of the Chassidim present indignantly confronted the doctor: "Don't you un­derstand that by phrasing the question in that way, you are forcing the Rebbe to answer in the negative? Today is a holiday, and Jewish law stipulates that on a holiday, an in­jection may be administered only on doctor's orders!" The doctor, realizing his mistake, turned back to the Rebbe. "Esteemed Rebbe! In my capacity as your physician, I must insist on an injection. This is absolutely essential. Pains of this magnitude can be life threatening." The Rebbe immediately gave his consent. In the meantime, the doctors had decided that the Rebbe must go to the hospital immediately. His condition was serious, requiring proper equipment and special care. The Rebbe's voice sounded weaker than usual, but his answer was firm: "I am not going anywhere. I am stay­ing here." A tense silence fell in the room. One of the doctors appealed to the Rebbe, "Your condition is very dangerous, and you know it. After all, you have demonstrated an excel­lent knowledge of medicine. This place is not equipped to provide you with the necessary treatment. By remaining here, you endanger your life - that is as clear as day. Only a hospital has everything needed to treat a patient in your condition. Moreover, experienced doctors will be constantly on hand to render their assistance if necessary. You should not remain here under any circumstances. We insist on im­mediate hospitalization." "I am not leaving," the Rebbe repeated. "I am staying right here." A second doctor tried to reason with the Rebbe, to no avail. The Rebbe had made his decision, and nothing could change it. After a hushed consultation, one of the doctors finally said, "If you do not consent to be hospitalized, we will leave at once and decline any responsibility for the consequences. As experienced specialists, we must warn you that you are putting your life at risk. If you refuse to go to the hospital, we cannot assume responsibility for your life!" At two a.m., the doctors packed up and left. Mere hours after his massive heart attack, the Rebbe was left without medical supervision or treatment. The Rebbe's secretaries and a number of Chassidim set about bringing medical supplies from the Jewish hospital in Brooklyn to "Seven-Seventy." One of the doctors on the hospital staff helped them find everything necessary. Within an hour, the Rebbe's office was transformed into a hospital room, complete with the most up-to-date medical gadgetry. The same doctor connected the Rebbe to the equipment and remained at his side. At five in the morning, he was shocked to discover that the Rebbe had suffered another heart attack. The dismayed secretaries began to lose their self-control. They themselves were on the verge of heart attacks. Everyone realized that the Rebbe must be provided with the best medical care possible. What were they to do? After spending a sleepless night at the Rebbe's bed­side, everyone had the same question: "What now?" Then, at about six a.m., one of the secretaries exclaimed suddenly, "Doctor Weiss! Doctor Weiss from Chicago! He is just what we need!" Doctor Weiss, a cardiologist, was one of the countless Jews who had joined the Chabad movement, and had even visited "Seven-Seventy." While still a young man, he had made a name for himself as a promising, gifted cardiologist. The secretary lost no time in calling Dr. Weiss. At first, the doctor was taken aback - it was a holiday, and making tele­phone calls on a holiday is permitted only in life and death cases. As soon as he was told about the situation, he curtly said he would be on the next flight to New York, and hung up. Several hours later, Dr. Weiss was standing at the Rebbe's bedside. After examining the Rebbe, he decreed. "It is difficult to treat the patient under these conditions. Diffi­cult, but not impossible. I will stay here as long as neces­sary, and I will take care of the Rebbe until he recovers." The Chassidim began the morning prayers. By then, every­one knew that the Rebbe had suffered a severe heart attack, but his instructions had been to continue the hakafot, per­forming the mitzvah of holiday rejoicing. How could they celebrate when the Rebbe was in such grave danger? At the same time, a minyan gathered in the Rebbe's room. The Rebbe recited his prayers while lying in bed; he then read the haftarah. The next morning, the Rebbe was already sitting up as he prayed. All through the second day, the Chassidim were ill at ease. The holiday was drawing to a close. Until then, the Rebbe had never missed leading a farbrengen at the end of Simchat Torah. Then a rumor began to circulate: the Rebbe was going to lead the farbrengen by microphone! The peo­ple could not believe their ears! A mere forty-eight hours ago, the Rebbe had suffered a massive heart attack! How could he possibly be well enough to talk, let alone deliver a discourse on Torah? Yet that is exactly what happened. In the blink of an eye, speakers were set up in the synagogue, and thousands of Chassidim listened to the Rebbe expound on Torah and Chassidism, as he always had at the end of Simchat Torah. Dr. Weiss had given the Rebbe permission to speak for only five minutes, but the Rebbe spoke for close to half an hour. No words can describe the emotions that filled the hearts of the Chassidim, and the spiritual elation that took hold of their souls! Could any doctor find a rational explanation for the medical miracle that had just taken place? That same evening, after the festival, the Rebbe began to sort through his mail. Hundreds of letters had accumu­lated in the office during the two-day festival. Even though the Rebbe still felt weak from the heart attack, he knew that somewhere in the far corners of the earth Jews were waiting impatiently for his reply, and neither his heart nor his physi­cal condition would prevent him from addressing their need. The secretary made a cautious attempt to stop him. "Perhaps the Rebbe should put the letters aside until he feels stronger?" "Is a Jew who wrote to me today less in need of help than someone who writes tomorrow?" replied the Rebbe. Usually, the Rebbe would receive the guests who had come to visit him for the holiday. This time too the Rebbe did not deviate from the tradition. Seated in his chair, with infusion tubes and monitor wires attached to his body, he welcomed the guests as they filed past him, and blessed them, "Shalom Aleichem, Peace be with you!" Many of the visitors could not stop themselves from crying. The Rebbe spent three weeks confined to his room at "Seven-Seventy," but he did not stop working all that time. He conducted weekly farbrengens that were broadcast on the radio. Dr. Weiss did not leave his side the whole time, watching over him day and night. In spite of the fact that the phone was ringing off the hook, urging him to come back to Chicago, Dr. Weiss cancelled all his operations, meetings and lectures. "I am not moving until the Rebbe has recov­ered." And the Rebbe did recover! 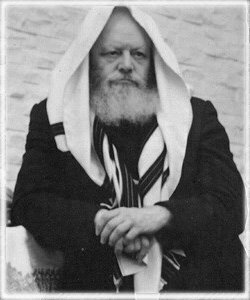 After five weeks, during which the Rebbe worked at full intensity, he was finally able to resume his normal routine, except for one change: he stopped giving private audiences. This was not only due to the heart attack; the number of people asking for yechidut had grown to the point where it became impossible to re­ceive them all. For that reason, the Rebbe discontinued the practice altogether, replacing it with the distribution of dol­lars for charity. The Rebbe exhibited the same optimism and sense of humor concerning his health as he did about other subjects. When a doctor pointed out that heart attacks recur in twenty-five percent of the cases, he remarked, "Why not stress the point that in seventy-five percent of the cases, the heart attacks do not recur?"